Sam Gumpertz (1868 – 1952) circled the globe six times and brought back authentic “wild men” from Borneo, Somalia warriors, plate-lipped Ubangi women from the Congo, and giraffe-necked women from Burma. Though not a freak himself, the cigar-chomping Gumpertz was the industry’s premier exhibitor of sideshow attractions. 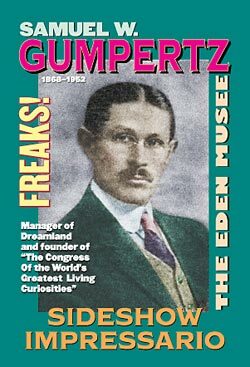 Gumpertz began his career at Coney Island’s Dreamland in 1904, the year it opened, with a smash hit: a miniature village populated by very small people called Lilliputia, also known as Midget City. The inhabitants, gathered by Gumpertz from expositions around the country, had their own parliament, their own fire department (which regularly responded to false alarms), and their own theater. For increased effect, Gumpertz installed a few giants to wander this experimental community from time to time. In 1909, Gumpertz was hired as general manager. When Dreamland burned down, Gumpertz immediately organized the Dreamland Circus Sideshow in a tent on Surf Avenue. The show continued through the 1920s and was influential in attracting freak shows to Coney Island after movies had eclipsed illusion rides in popularity. In 1929, on the eve of the Depression, Gumpertz left Coney Island to work with the Ringling Brothers Circus.